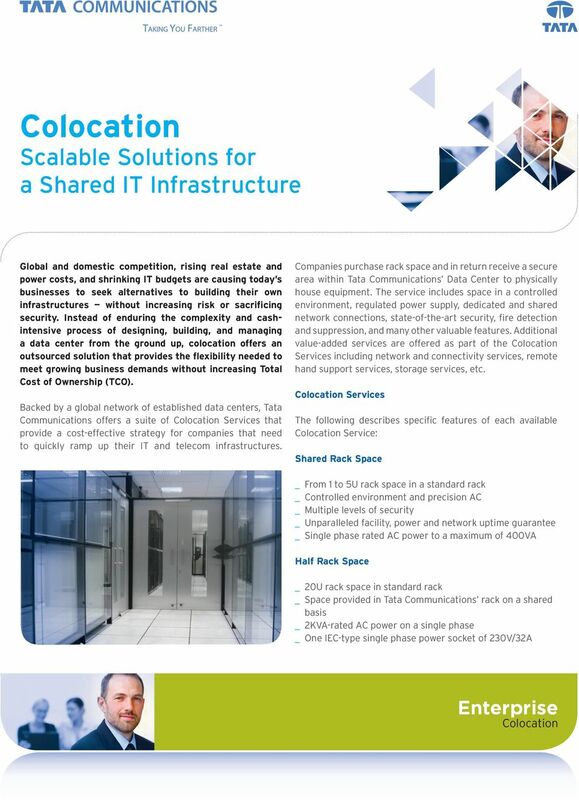 Download "Colocation. Scalable Solutions for a Shared IT Infrastructure. Enterprise. Colocation"
3 Additional features of Tata Communications Services include: Capped bandwidth for predictable fixed bandwidth requirements over time Burstable bandwidth for varying bandwidth usage over time with charges based on the 95th percentile model Customized connectivity provided for point to-point dedicated link gigabit port available for high bandwidth requirements continuity and disaster recovery plan requirements. With large amounts of bandwidth piped through the data center, a customer can access far more bandwidth than it could on its own. Additional benefits include the following: Security Mission critical operations require the highest level of security. 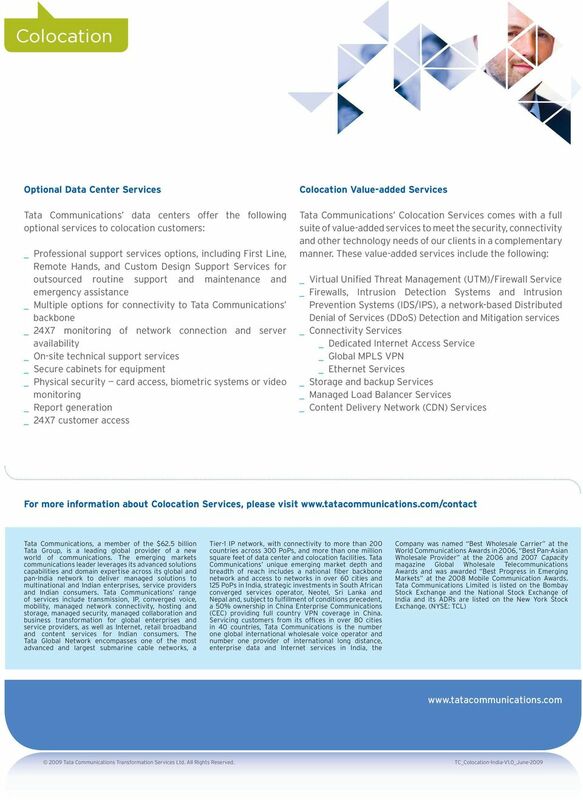 As a top-tier colocation services provider, Tata Communications data centers deliver multilevel physical security through a combination of secure access and 24X7 surveillance. A pre-screening background check determines eligibility of colocation site access. Also, all areas of the colocation site both internal and external are continuously monitored and recorded by highly sensitive security cameras. Access to the colocation site is controlled through utilization of proxy card swipe or biometric hand geometry readers. 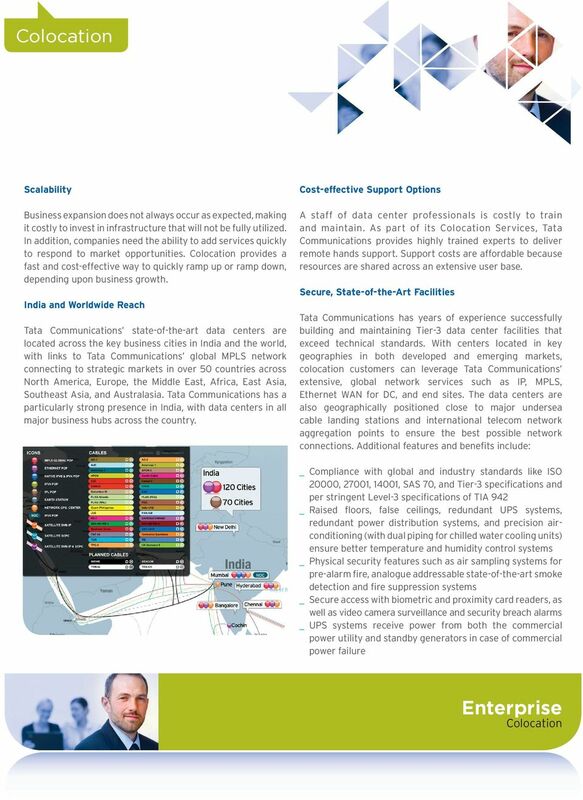 Maximum Availability Security and High Availability Benefits of Services Tata Communications Services offer an affordable strategy to reap the benefits of a high tech, global data center without incurring huge, upfront, capital expenditures. 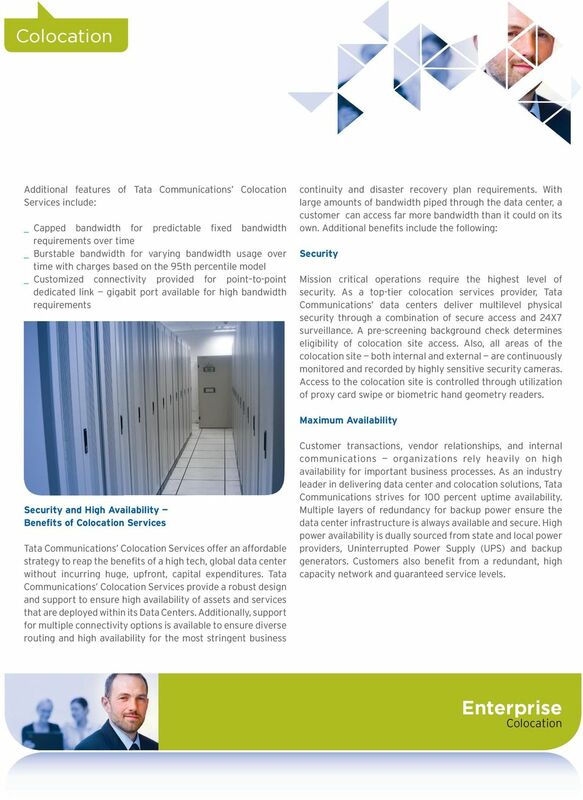 Tata Communications Services provide a robust design and support to ensure high availability of assets and services that are deployed within its Data Centers. Additionally, support for multiple connectivity options is available to ensure diverse routing and high availability for the most stringent business Customer transactions, vendor relationships, and internal communications organizations rely heavily on high availability for important business processes. 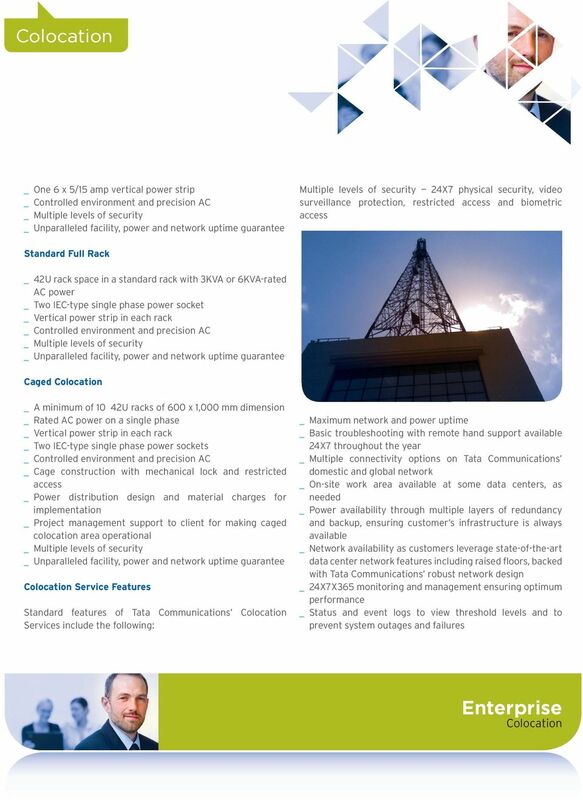 As an industry leader in delivering data center and colocation solutions, Tata Communications strives for 100 percent uptime availability. Multiple layers of redundancy for backup power ensure the data center infrastructure is always available and secure. High power availability is dually sourced from state and local power providers, Uninterrupted Power Supply (UPS) and backup generators. Customers also benefit from a redundant, high capacity network and guaranteed service levels. WAN Ethernet Services Portfolio End to End Service Level Agreements from Downtime and poor performance lead to Dissatisfied customers and lower profits. Maintaining end to end service levels is essential. WAN Ethernet Services Portfolio Flexible, Reliable Service to More Locations with Business is dynamic. Markets change. You know from experience that the most adaptable companies are the ones that thrive. Confessions of a Telecommunications Provider Five things you MUST know about Global Voice over IP (VoIP) Providers 1 Contents 3 Introduction 5 Aren t all VoIP networks the same? 6 Delivery is everything! Tata Communications Security Outsourcing. A Must-have for Entry into the Global Economy. www.tatacommunications.com. www.tatacommunications. Global opportunities and greater revenue through Partner Services A white paper Contact Us Share 2015. All Rights Reserved. TATA COMMUNICATIONS and TATA are trademards of Tata Sons Limited in certain countries. Contents Error! Bookmark not defined. Error! Bookmark not defined. Error! Bookmark not defined. Overview NetSource is a Chicago area (Naperville) hosting company that owns and operates its own world class datacenter. The initial datacenter buildout was put into operation in 2007 and expanded in 2013.